Spring has sprung - and what better way to celebrate it than by ham radio. 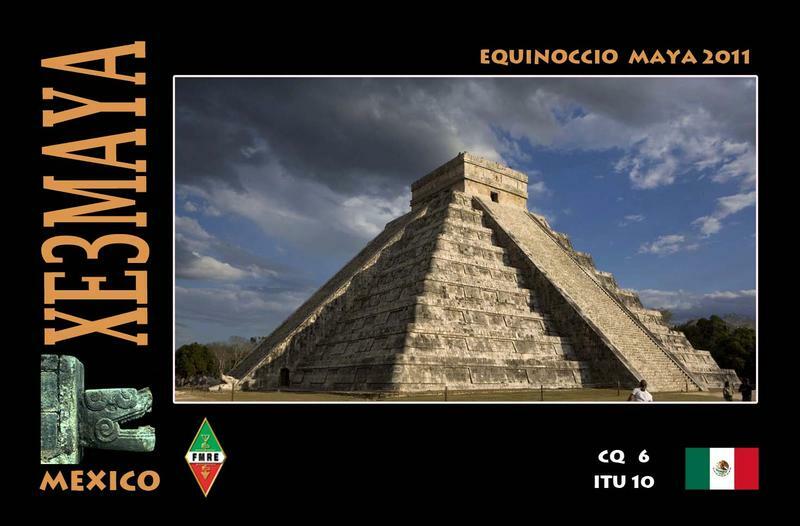 Today I worked a neat Special Event station, XE3MAYA/D on PSK31 (on 15 meters) in the Mexican Yucatan celebrating the 2011 Mayan Equinox. 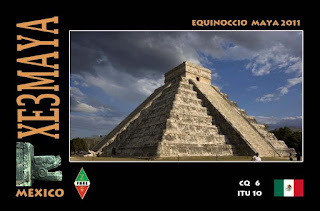 This was a neat one for me as I had majored in college in North and South American anthropology and many years ago I had visited the Mayan ruins at Chichen Itza (depicted in the XE3MAYA QSL card). I'm going to enjoy this QSL card when it arrives! After the 8.9 earthquake that struck near Sendai, Japan at 2:46 JST (0546 UTC) on Friday, March 11, the island nation is trying to recover. Soon after the earthquake -- which the US Geological Survey (USGS) is calling the largest to hit the island nation in 140 years -- Japan has been rocked by tsunamis and power outages caused by trouble at a nuclear power station. Reports from Japan tell of phone and Internet service still up in most parts of the country. The Japan Amateur Radio League (JARL) -- that country’s IARU Member-Society -- has asked that 7.030 MHz be kept clear for emergency use. Other reports are asking that these additional frequencies be kept clear: 3.525, 7.030, 14.100, 21.200 and 28.200 MHz. Yamamoto said that Toru Tanaka, JR3QHQ -- the JARL Branch Manager in Osaka -- is monitoring 7.043 MHz, gathering incident information on the radio and forwarding this information via the Internet. The Hindu Business Line, a newspaper in India, reported that hams in India are contacting hams in Japan to get information concerning their loved ones. When a father in India could not get in touch with his daughter in Japan after the quake, he turned to a friend who was a radio amateur. In turn, the Indian amateur posted a message on an e-mail reflector where another ham relayed the message to a radio amateur in Japan. Through this method, the father learned that his daughter was safe. Yamamoto said that as of 10 AM (JST) on Monday, March 14, police in Japan have stated that the death toll has risen to 1627, with 1720 people still missing. “It is only the official count and the number is still expected to increase,” he said. “Thousands of bodies are reported to have been found on the coast of the tsunami-suffered area.” IARU Region 3 Disaster Communications Committee Chairman Jim Linton, VK3PC, said that a source in the Miyagi prefecture reported that the death toll will be in the order of tens of thousands in that prefecture alone. The earthquake also damaged electric power generation plants fuelled by oil or natural gas, resulting in a shortage of electricity. Linton said that Tokyo Electric Power Company plans to stop supplying power to certain parts of its service area on rotation basis to cut power consumption. This shortage of power may also stop or restrict the operation of the train systems around Tokyo. Tsunami waves reached Santa Cruz, California -- about 100 miles south of San Francisco -- around 8 AM (PST) on March 11. Early that morning, the Santa Cruz County ARES® Team activated the Santa Cruz County Tsunami Resource Net in advance of the anticipated 5-7 foot wave. According to Santa Cruz County ARES® Public Information Officer Bill Conklin, AF6OH, more than 30 local ARES® members staffed various served agencies, including the Santa Cruz County Emergency Operations Center, the American Red Cross, Salvation Army Canteen Truck One, the Santa Cruz County Harbor Coast Guard Auxiliary and a number of local fire departments. In addition to the served agencies, a number of hams provided remote observation of the coast line and communications capabilities at the evacuation centers. The tsunami waves impacted the coast and did an estimated $15 million of damage to the Santa Cruz Harbor. More than 100 boats -- including fishing vessels, pleasure boats and yachts -- were either damaged or sunk as a result of the waves. In Northern Nevada, hams spent the weekend preparing to handle health and welfare messages in and out of Japan. In a joint exercise, Storey County and Washoe County ARES® members spent two days establishing communications protocol on HF, VHF and on Internet-based voice and data communications systems. According to ARRL Storey County Emergency Coordinator Tom Taormina, K5RC, this was the first time that many of the ARES® members used HF communications to operate in a joint exercise with neighboring counties and foreign countries. Taormina said that more than a dozen Japanese hams were contacted, all of who were outside the earthquake area. “We are now on standby, awaiting permission of the Japanese government to begin formal third party communications relays,” he said. It’s an annoying ritual to some: In most areas of the U.S. (except Arizona and Hawaii - where there's plenty of sunlight anyway), clocks go back in the fall and ahead for spring, but why do we do it, when did it start and how does it affect our lives? Yeah, yeah, we understand that time shifting began as a way to conserve energy, but why is the middle of the night (2 AM) the official clock-tweaking time? It’s not like anybody sets an alarm to wake up so they can fix the clock and go back to sleep. Jeanna Bryner, managing editor of Livescience.com, said the federal government wanted people to be safely at home for the switch — and bars and restaurants to be closed. In 1784, Benjamin Franklin lightheartedly suggested the idea to a Paris newspaper to conserve candles. In 1784, after noticing how many residents slept through sunny summer mornings, Franklin published an anonymous, satirical letter to Parisians suggesting they get up two hours earlier to conserve candles. Franklin did not suggest they adopt Daylight Saving Time (DST), although often mistakenly credited as doing so, but he did foreshadow a primary controversy that has followed DST around since its 1895 conception by New Zealand entomologist George Vernon Hudson (who enjoyed the extra daylight to scour for insects) – does DST actually save energy? Germany was the first to introduce it, during World War I. Britain and the United States followed. 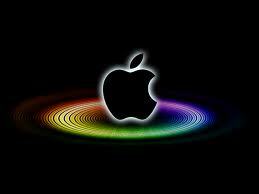 Now, about 70 countries have some form of it, covering more than 1 billion people. Except for a handful of adjustments, DST as we know it in America has been around since the 1960s, when Congress passed the Uniform Time Act, which did not force all states to adopt DST, but merely said that if adopted it must be done uniformly. At that time, it was thought DST would save energy on incandescent lighting, then the primary use of electricity, although now things are more complicated due to widespread heating and cooling. Daylight Saving Time makes summer days longer, as well as a portion of spring and fall days. As it stands right now, Standard Time “springs forward” at 2:00am on the second Sunday of March, creating darker mornings and brighter evenings until, on the first Sunday in November, it “falls back” into Standard Time. The idea is that people will be happier and more active thanks to more after-work daylight hours to spend outdoors. It’s also believed to conserve energy because the sun is out later and homes are naturally warmer and well-lit until closer to the average person’s bedtime. Obviously, darker, potentially colder mornings would increase the need for light and heat before work, but the belief is that lower energy usage at night outweighs increased usage in the morning. Thus, energy and money is saved. Well, the thing about it is…who the hell knows? No one can seem to agree whether DST saves or costs both energy and money, or whether it is simply obsolete. Most of the world’s population does not adhere to DST. According to the California Energy Commission, some 70 countries worldwide embrace it and, while that may seem like a lot, note that most of Africa and Asia do not. So DST is definitely in the minority in terms of global population. In the United States, most of Arizona and all of Hawaii do not oblige the time change. Much of Indiana did not until the latest DST adjustment by the Bush administration, but more on that in a moment. The recreation, retail, sports and tourism industries have historically supported DST because more time for consumers to be out and about means more money for these sectors. Farmers and the entertainment industry tend to oppose it because a farmer’s schedule is dependent on sunlight, and longer days cut into prime-time revenues for entertainment outlets. But none of that is here or there in terms of energy. After World War I, daylight saving was left up to local governments in the U.S. It was reimposed nationwide to conserve energy during World War II and lifted again after the war ended in 1945. Without a federal mandate, chaos ensued. In Iowa alone, 23 different pairs of start and end dates were used in cities and towns around the state. Now, the U.S. government doesn’t require that states mandate daylight saving but does demand those on board do it at the same time on the clock and for the same stretch of the year. Daylight saving begins on the second Sunday in March and ends on the first Sunday in November, when clocks are turned back an hour. For the record: Clocks spring ahead before spring, which doesn’t officially begin until March 20. Sleep experts estimate millions of people are affected — however temporarily — by the return of daylight saving each spring. If the change proves troublesome long term, avoid reading, eating or watching TV in bed. Still awake? Go for complete quiet and darkness, and a slightly cooler temperature in the room. In 2008-2009, sunspots almost completely disappeared for two years. Solar activity dropped to hundred-year lows; Earth's upper atmosphere cooled and collapsed; the sun’s magnetic field weakened, allowing cosmic rays to penetrate the Solar System in record numbers. It was a big event, and solar physicists openly wondered, where have all the sunspots gone? In the artistic cutaway view of the sun shown above, the "Great Conveyor Belt" appears as a set of black loops connecting the stellar surface to the interior. "Plasma currents deep inside the sun interfered with the formation of sunspots and prolonged solar minimum," says lead author Dibyendu Nandi of the Indian Institute of Science Education and Research in Kolkata. "Our conclusions are based on a new computer model of the sun's interior." 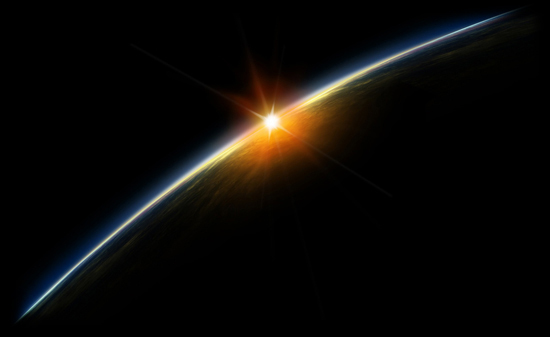 For years, solar physicists have recognized the importance of the sun's "Great Conveyor Belt." A vast system of plasma currents called ‘meridional flows’ (akin to ocean currents on Earth) travel along the sun's surface, plunge inward around the poles, and pop up again near the sun's equator. 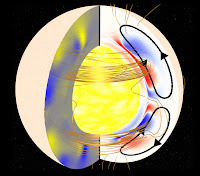 These looping currents play a key role in the 11-year solar cycle. When sunspots begin to decay, surface currents sweep up their magnetic remains and pull them down inside the star; 300,000 km below the surface, the sun’s magnetic dynamo amplifies the decaying magnetic fields. Re-animated sunspots become buoyant and bob up to the surface like a cork in water—voila! A new solar cycle is born. For the first time, Nandi’s team believes they have developed a computer model that gets the physics right for all three aspects of this process--the magnetic dynamo, the conveyor belt, and the buoyant evolution of sunspot magnetic fields. "According to our model, the trouble with sunspots actually began in back in the late 1990s during the upswing of Solar Cycle 23," says co-author Andrés Muñoz-Jaramillo of the Harvard-Smithsonian Center for Astrophysics. "At that time, the conveyor belt sped up." The fast-moving belt rapidly dragged sunspot corpses down to sun's inner dynamo for amplification. At first glance, this might seem to boost sunspot production, but no. When the remains of old sunspots reached the dynamo, they rode the belt through the amplification zone too hastily for full re-animation. Sunspot production was stunted. The blue curve in the above graph shows the cyclic variation in the number of sunspots over the last century. Red bars show the cumulative number of sunspot-less days. The minimum of sunspot cycle 23 was the longest in the space age with the largest number of spotless days. Later, in the 2000s, according to the model, the Conveyor Belt slowed down again, allowing magnetic fields to spend more time in the amplification zone, but the damage was already done. New sunspots were in short supply. Adding insult to injury, the slow moving belt did little to assist re-animated sunspots on their journey back to the surface, delaying the onset of Solar Cycle 24. "The stage was set for the deepest solar minimum in a century," says co-author Petrus Martens of the Montana State University Department of Physics. Colleagues and supporters of the team are calling the new model a significant advance. "Understanding and predicting solar minimum is something we’ve never been able to do before---and it turns out to be very important," says Lika Guhathakurta of NASA’s Heliophysics Division in Washington, DC. Three years ago on March 2, 2008, the face of the sun was featureless--no sunspots. Credit: SOHO/MDI While Solar Max is relatively brief, lasting a few years punctuated by episodes of violent flaring, over and done in days, Solar Minimum can grind on for many years. The famous Maunder Minimum of the 17th century lasted 70 years and coincided with the deepest part of Europe's Little Ice Age. Researchers are still struggling to understand the connection. One thing is clear: During long minima, strange things happen. In 2008-2009, the sun’s global magnetic field weakened and the solar wind subsided. Cosmic rays normally held at bay by the sun’s windy magnetism surged into the inner solar system. During the deepest solar minimum in a century, ironically, space became a more dangerous place to travel. At the same time, the heating action of UV rays normally provided by sunspots was absent, so Earth’s upper atmosphere began to cool and collapse. Space junk stopped decaying as rapidly as usual and started accumulating in Earth orbit. And so on…. Nandi notes that their new computer model explained not only the absence of sunspots but also the sun’s weakened magnetic field in 08-09. "It's confirmation that we’re on the right track." Next step: NASA’s Solar Dynamics Observatory (SDO) can measure the motions of the sun’s conveyor belt—not just on the surface but deep inside, too. The technique is called helioseismology; it reveals the sun’s interior in much the same way that an ultrasound works on a pregnant woman. By plugging SDO’s high-quality data into the computer model, the researchers might be able to predict how future solar minima will unfold. SDO is just getting started, however, so forecasts will have to wait. Indeed, much work remains to be done, but, says Guhathakurta, "finally, we may be cracking the mystery of the spotless sun." OK - now it's time for me to get working on my DXCC endorsements! I admit it, I'm an SOB - a "Son of Bernie" that is. 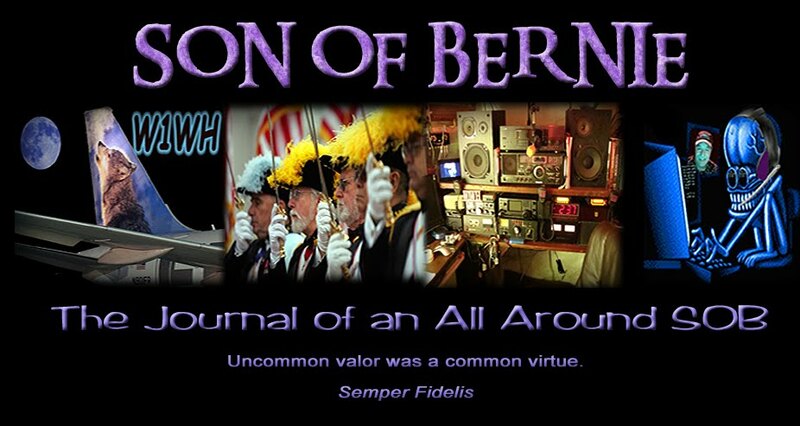 "Son of Bernie" is a tribute to my late father (the finest man I've ever known) but also touches on my interests in amateur radio, flying, Catholicism and family. I'm "Bumpa" to my six grandkids and W1WH to fellow ham radio operators around the world. 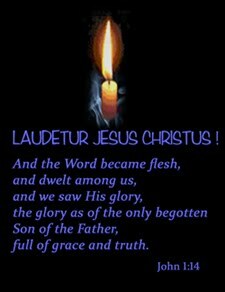 I'm the father of three, an adult revert to the Catholic faith of my childhood and a Fourth Degree member of the Knights of Columbus. I've had lifelong interests in ham radio and shortwave listening as well as flying (private pilot). My wife Jane (who's usually the smartest person in the room) and I are on and off again members of Mensa (but don't take it very seriously). Our mission in life is spoiling our six grandchildren, thus saving them from the deprived lives which their parents believe they experienced while growing up. Professionally, I've developed hundreds of wireless and fiber optic amplification sites throughout the USA. Since 2004 I've been involved with upgrading New England wireless networks for both Sprint and AT&T and am currently working on a large scale modernization project for T-Mobile.